Brighton manager Chris Hughton. Picture by PW Sporting Photography. 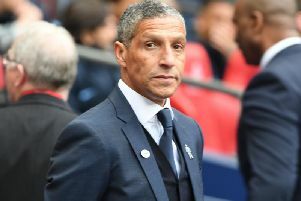 Brighton boss Chris Hughton hailed the impact of two of his players as the Seagulls defeated Everton 1-0 at home to claim a first win in five in the Premier League. Jurgen Locadia's goal proved to be all the difference as Brighton picked up their first home victory over the Toffees since 1982 and record their first clean-sheet since October. After the game the Seagulls boss was full of praise for goalscorer Locadia, as well as David Button after he came in to replace the Asia Cup-bound Maty Ryan. It was a good win against a very good team who I think will be right up there. When they made the offensive changes they put us under real pressure at the end. I know they're two home performances but I thought for 60, 65 minutes against Arsenal we were really good and that enabled us to start well today. That helped confidence and got the crowd lifted from the start. There weren't going to be too many chances I think and fortunately for us we got the one that counted. I'm really pleased to have the partnership back but I would certainly put the clean-sheet down to the team performance because Leon Balogun has come in and done well over that period of time. I wouldn't want to do him a disservice but I thought the two of them were good and they needed to be. Everton had a lot of pace and a lot of quality up front and I think it needed a very good defensive display from the two, particularly in that last 15, 20 minutes when we knew we were going to put them under pressure. He's always been ready and the fact that he hasn't played as much as we would've liked is more down to my decisions. There was a period after he came in when he did need to get up to speed but I think with the form of Glenn (Murray) in the second half of last season and bringing in Florin (Andone) has made it difficult for him. He's always been ready and he has trained well and I'm really pleased that now he's got his chance that it has reaped benefits for him. He's a really decent lad but we are aware that he wouldn't have been happy if he wasn't playing and I can understand that. It's been a year now and every player wants to play. If he had played more regularly than what he has done, then there wouldn't have been a problem. He's taken his chances and our thoughts have never been about him going but keeping him. The system gives us more options to play. In a three up front he can play in any one of the front three. Credit to him though. He's the one who deserves it. He's another one I'm delighted for because although he is a very experienced goalkeeper it's never easy coming in at this stage of the season following Maty Ryan, who has done so well for us. It wasn't an easy decision because I've got two goalkeepers who are really pushing but David's experience managed to give him the nod. It's great for him to come in on his first game and, not only be a part of a winning team, get a clean-sheet. That'll do him a world of good. The linesman, and I'll have to check, put his flag up. Initially after that he called the referee over and when you see the incident it's quite clear that it comes off Gomes. When you see the reaction of the players, in particular Locadia, it looks quite obvious. In the end, I'm not sure how difficult the decision was but we're just glad they gave the decision.